Home Lifestyle Mom and Daughter on a Mountain – Hiking with my Little Charm! This Mothers Day, I am looking 2 years back! When I was planning a hike with my 4.5 year old daughter – everyone kept saying it was a useless thing to do. Why? Because she is too small and she would never remember anything when she grew up! I said – USELESS argument! Why wait for 10 years??? Why wait for the time when they are already obsessed with the screen?? Take them out early, let beautiful outdoors be a part of their lives! I showed her pictures of our destination and the excitement on her face was enough for me to take the plunge! And this is – how we went ahead with our first trek together! I checked with another friend – so here was a team! Two moms and two daughters! We were ready for everything! We didn’t pack ourselves into an organized tour. We went to Tirthan Valley, 2 hours before Kullu – a serene little place, at the entrance of the Great Himalayan National Park, hugged by a river and a lovely guest house by the name of The Himalayan Trout House. My hunch was – This is going to be fun. We left the Delhi Railway Station to spend a night in Chandigarh followed by an 8 hour drive to Tirthan! We are early morning travelers. Through the way we talked about how we were going to go for long walks everyday. We decided to take tough walks up the mountain (this was big part of the zest for hiking). We carried Ludo, craft activities and a box full of paints and colors. And we were very excited about catching fish! Day 2 – Trail Hiking – Tirthan is a treasure for walkers and trail hikers! One such trail hike was to the trout farming area. That sounded brilliant. We could get a nice hike up and also see trout farming! We were again thrilled! My daughter stared at the rapids being forming in the gushing river. A hike that could have taken about 30 minutes, took us a long time because we stopped many times to admire the river, a random plant that took my daughter by surprise and we didn’t forget to throw small pebbles in the river. I know it did a lot of good to her. She comes from Gurgaon and even at the age of 4.5, she knows how precious this trip was becoming everyday for her. Mountains and the serenity around them – you can’t stop surrendering by and by! Day 3: Back to Fishing and hours of playing with pebbles and sand! 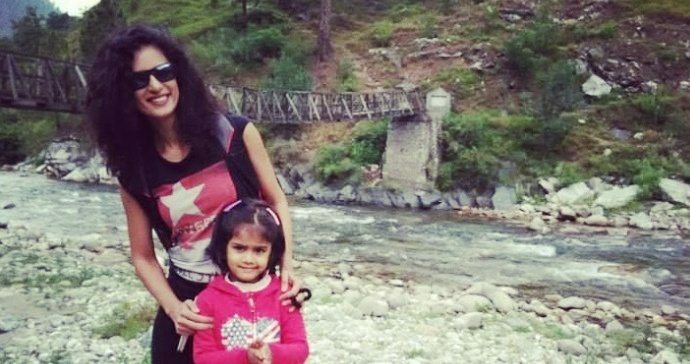 My friend Parul and her little daughter Mihira made great travel partners. Because of Parul – I was able to go running and my daughter got a break from me playing with her friend Mihira too! My daughter is hooked and so with total mutual consent we are going to the mountains very soon again. Hiking is great for kids in these times when unstructured play is waning and the screen rules ours and their lives! Happy Hiking Moms and Daughters! And a very Happy Mothers Day to each and every Mommy Rockstar out there! Awesome post Tanya and I totally agree. It’s important to get the kids to appreciate nature early. I am just back from Tirthan after a trek to Lambri with my 11 and 6 year old and they absolutely loved it ! That sounds enviable! I can keep going back to Tirthan, it has the easy and the tough trails and one can pretty much chose what they want to do given the age of the kids. Happy to know you chose to hike with your kids. I just feel that it’s the most natural way to connect with kids outside the four walls of school and home! Kudos to you for having taken this adventure – because I do know how tough this can be!